The virus enters through a person's mouth, multiplies in the intestines and targets the nervous system. Travelling along nerve fibers, the virus destroys motor neurons, resulting in muscle failure. The legs are most often affected. In the most severe cases, the muscles of the torso are affected; without working muscles, one can not breathe. Initial symptoms include fever, tiredness, vomiting and headache. Within hours of becoming infected, the person can become irreversibly paralyzed. This happens in about 1 out of every 200 infections. Among those who become paralyzed, about 5-10% die because the muscles involved in breathing can not function. The disease is spread from person-to-person; poor hygiene and sanitation contributes to the spread of polio as an infected person excretes the virus in feces. Nowadays, people in the US rarely think of polio, an infectious disease caused by a virus. Just 50 years ago, however, the virus was a real threat to children (mainly under the age of 5), causing thousands of children to become paralyzed. Many people died from polio. Children with paralyzed legs used wheelchairs, braces or crutches to get around. Parents would not allow their children to swim in natural swimming holes or rock quarries out of fear that the polio virus might lurk there. A real sense of panic set in every summer, when the number of cases rose sharply in the US (and Western Europe). Huge mechanical contraptions called iron lungs were used to assist breathing in those whose paralysis involved the torso. There is no cure for polio, making prevention the key in beating this highly infectious virus. In the mid-1950s, Dr. Jonas Salk developed an injectable polio vaccine (IPV) from the inactivated (killed) virus. A few years later, Dr. Albert Sabin developed an oral polio vaccine (OPV) from a "live" virus. This became the vaccine of choice worldwide because it is less expensive, easier to give (no needle or trained health caregiver needed) and rapidly stops the spread of polio. The only disadvantage is that in rare cases, perhaps 1 out of every 2.5 million doses, the vaccine gives the recipient polio. As a result of this vaccine-induced polio, in 2000 the US government stopped using the "live" virus vaccine. Since using IVP, the last US case of vaccine-related polio was documented in 1999, according to a study published in the Journal of the American Medical Association. More work worldwide is still needed to stamp out polio completely. The goal of the Global Polio Eradication Initiative, a joint effort by the WHO, Rotary International, the US Centers for Disease Control (CDC) and UNICEF, is to have zero new cases of polio by 2005. Since 1988, when the Initiative started, the number of polio cases worldwide has dropped 99%. 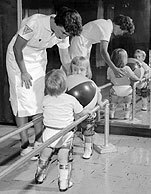 As recently as 1988, more than 125 countries on five continents were home to the polio virus, resulting in more than 1,000 children per day becoming paralyzed. In 1988, there were 350,000 cases worldwide; by 2002, thanks to vaccination efforts, the worldwide count was down to around 1900 cases. Polio is still a threat to children in seven countries in sub-Saharan Africa and south Asia. As of November 24, 2004, there were a total of 683 cases in Nigeria, 91 in India, 40 in Pakistan and 21 in Niger. There were a few cases in Afghanistan and Egypt. The last case of naturally occurring paralytic poliomyelitis in the US was in 1979. Since 1961, when the Sabin vaccine (OPV) was used, an average of 9 cases of vaccine-associated paralytic poliomyelitis were confirmed each year until 1989. For a country to be certified as "polio-free," there must be no polio cases for three years. If polio can be wiped out next year, it will be the second disease to be wiped out by humans. The first was smallpox; the last case of smallpox was documented in 1978. Interview a parent or grandparent (or an older friend or neighbor) and ask about their memories of polio. Alexander, L.N., et al., "Vaccine Policy Changes and Epidemiology of Poliomyelitis in the United States," JAMA 2004; 292:1696-1701. This article prepared by Ellen Kuwana, Neuroscience for Kids Staff Writer.